Refrigerated tabletop micro-centrifuge: Eppendorf Centrifuge, Model # 5415C. Repeat pipettors and regular Pipetman: 250 µL and 100 µL, respectively. 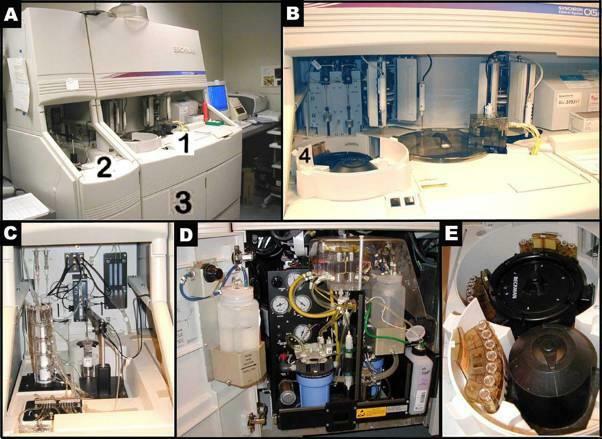 Automated blood chemistry analyzer: Synchron CX5 Delta (Beckman Coulter, Inc., Fullerton, CA). A dedicated DOS-based desktop computer controls the programming of this analyzer. A dedicated printer prints the results as they are measured, and an electronic file is simultaneously transferred to a second, Windows-based computer, which stores the data files. Reagents: The Chemistry Analyzer (or “CX5”) uses Beckman Coulter three-compartment reagent cartridges for HDL, CHOL, TG, and GLU. Each cartridge contains enough reagents for 300 tests (approximately 104 mL). In addition, in order to run the HDL Cholesterol test, HDL Cholesterol Separation Reagent (15 µL per sample) is needed. The bottle from Beckman Coulter contains a volume of 34 mL. If the dilution of plasma samples becomes necessary due to low plasma volume, use 0.9% saline solution for the dilution. Calibration Reagents: The two calibration reagents are “Synchron® Systems HDL Cholesterol Calibrator” (for HDL only), and “Synchron® Systems Multi Calibrator” (for CHOL, GLU, and TG). Controls: The controls for HDLc are Beckman Coulter™ Vigil™ Lipid Control 1 and Beckman Coulter™ Vigil™ Lipid Control 2. The controls for CHOL, GLU and TG are Synchron® Control Comprehensive Chemistry Control Serum Level 1, Level 2 and Level 3. Diluent for electrolyte samples: Synchron® Control Comprehensive Chemistry Control Plasma Level 1 (Beckman Coulter, Inc., Fullerton, CA) or pooled mouse plasma. In general all mice are brought into the procedure room and are tested within 1 h.
a. Mice at 6-7.5, 12-13.5 and 18-19.5 months of age are bled from 7:30 am to 11:30 am. b. Bodyweight measurements are recorded just before blood samples are drawn. c. A minimum volume of 250 µL (~ 13 drops) blood is obtained via peri-orbital vein using heparin-coated microhematocrit tubes and collected into microtainer tubes. d. Blood is allowed to clot at room temperature for no more than 30 min. and serum is subsequently collected after the blood sample in microtainer tubes is centrifuged at 14,000 rpm, for 10 min, at 4°C. e. The method used for the measurement of Calcium and Phosphorus is based on colorimetric assay, hence, they are included in the blood chemistry panel. f. Constituents of the plasma electrolyte panel included calcium (Ca), chloride (Cl), iron (Fe), magnesium (Mg), phosphorus (P), potassium (K), sodium (Na), and carbon dioxide (CO2). For Electrolyte analysis, 55 µL of plasma sample is diluted with 55 µL of diluent. g. In applying serum samples to each (disposable) sector cups, extreme care is done to avoid creating bubbles that can compromise the accuracy of the colorimetric analysis. In the event of a bubble formation, a pipette tip or a toothpick is used to burst or dissolve it (see Figure below, red arrow). h. Final sample volume included the "dead volume" (40 µL) of the machine plus 110 µL for plasma electrolytes..
i. Extended storage of serum is done at -70°C. a. Mice at 6-7.5, 12-13.5 and 18-19.5 months of age are fasted for 4 hrs, from 7:30 am to 11:30 am, before they are bled. c. A minimum volume of 250µL (~ 13 drops) blood is obtained via peri-orbital vein using heparin-coated microhematocrit tubes and collected into microtainer tubes. d. Plasma is collected after the blood sample in microtainer tubes is centrifuged at 14,000 rpm, for 10 min, at 4°C. e. An aliquot of 30 µL per sample is saved in Eppendorf tubes for IGF-I assay. The rest of the plasma (65 µL) is used for other hormone assay (i.e. insulin, leptin). f. Extended storage of plasma is done at -70°C. a. In preparation for the auto-analyzer, bar-coded sectors with cups in place are loaded with 85 µL of completely thawed plasma (enough for the direct measurement of CHOL, GLU, and TG). c. The Beckman CX5 is operated according to manufacturer’s instructions in the measurement of plasma HDL, CHOL, GLU, and TG, which are run together. -Function key F2 is used to deploy “Program Batch/Sector(s)” and “sector(s) to program:” (i.e. sectors 1-5 is programmed). When "Batch mode activated, 7 cups possible. Number of cups in batch:" message is displayed, the total cups for this batch is then (7 x 5) = 35 cups (the maximum number of cups that can be ran in a batch is 98). To program remaining sectors, F2 Program Batch is deployed again. -Panel “12” is preprogrammed for CHOL/GLU/TG and “HDLD” is manually “Selected” from the screen menu (for a direct measurement of HDL). Once the correct chemistries are selected, they are “ENTERed” to bring about “SAMPLE TYPE”, wherein “2” is given to denote plasma (not serum). e. Once a sector is finished running, the results are automatically printed, removed from the printer, and then labeled accordingly. Otherwise, the printed paper is checked and guarded from rolling back into the printer and disrupting the data recording. f. Used Eppendorf tubes, pipette tips, sector cups, and reagent cartridges are discarded into biohazard waste containers, and any spilled liquids are cleaned. g. For additional information: The Jackson Aging Center (JAC). Serum electrolytes at 6, 12, and 18 months of age: calcium (Ca), chloride (Cl), iron (Fe), magnesium (Mg), Phosphorus (P), potassium (K), sodium (Na), and carbon dioxide (CO2). Plasma and serum enzymes at 6, 12, and 18 months of age: alanine aminotransferase (ALT), lipase (LIP), alkaline phosphatase (ALP), total bilirubin (TBIL), thyroxine (T4). Plasma proteins at 6, 12, and 18 months of age: albumin (ALB), total protein (TP). Plasma high density lipoprotein (HDL) direct measurement at 6,12, and 18 months of age.